Striking staff members of Turkish Airlines joined the protests in Istanbul on Wednesday, tying their ongoing battle for better working conditions to the mass demonstrations against the Erdogan government that started last week. To raise awareness, the airline's flight attendants put out a quite remarkable in-flight safety briefing. "We would like to draw your attention to the issues on strike, prior to departure," said dozens of employees wearing Guy Fawkes masks. "Your life vest is your companion near you. In case you need to, you can reach with your arm easily. In case of alarm, life vest will give your morale and motivation. Hold your life jacket, pull it toward you and hug tightly." Turkey's Hurriyet News reports that the flight attendants performed the stunt at Galatasaray Square in Istanbul, near the heart of the protests. An earlier YouTube video shows the group performing at the Turkish Airlines headquarters. The newspaper adds that the stunt ended with the same slogan used by protesters in Gezi Park: "We will win by resisting!" Employees of Turkish Airlines have been on strike since May 15. Turks took to the streets en masse last Thursday, when the government started the destruction of a popular park in Istanbul in favor of a replica of Ottoman barracks and a shopping mall. In the wake of security forces' violent crackdown on the peaceful demonstration, protests have morphed into a larger cry of anger against the Erdogan government. Three demonstrators have lost their lives in the violence so far. 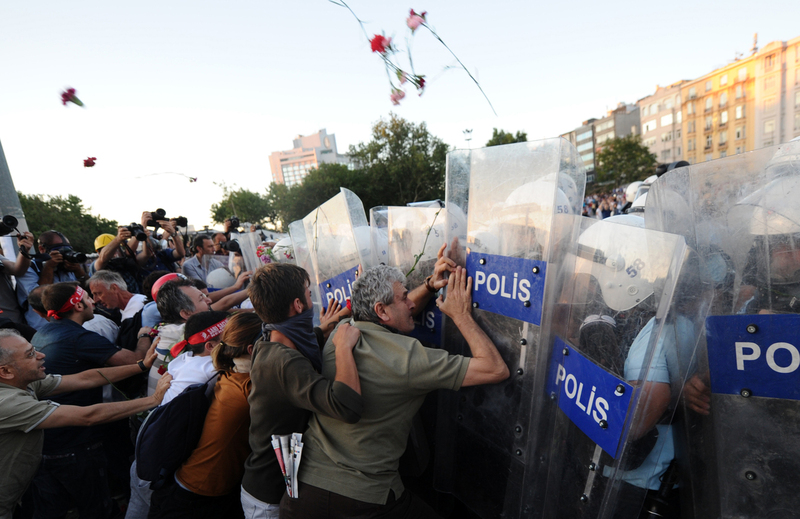 For more information on the protests in Turkey, read our backgrounder, "Why Is Turkey Protesting?"